After being announced nearly a year ago very little has been heard of about this game. Check out IGN's page for some old screenshots and a video. This 2D side scroller for the Nintendo DS is a classic Super Mario Bros. style game featuring Princess Peach Toadstool as the hero. Finally in the October 2005 issue of Nintendo Power we get some news about this game. It will feature over 40 levels. 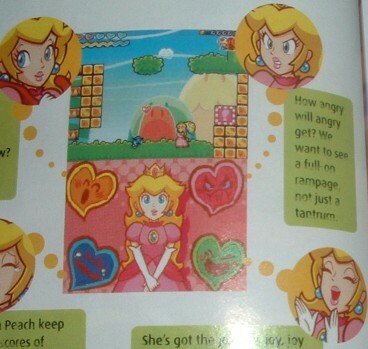 The dual screen will be keep constant track of Peach's mood which is affected by power ups transitioning it over 4 different emotions. No word on how these emotions will actually affect game play. A look at a screenshot included in the magazine shows that there has been a graphics overhaul since the first images seen last year. Most notable are the improved graphics on the emotion window, which is now on the bottom instead of the top, and the main window can be seen to have differences in the health metre, points and stuff. The game is slated for an October 20th release date in Japan. No date has been set for a domestic release yet.